Sometimes you’re aware of the milestone moments in your life, sometimes you only recognize their importance upon reflection. We might try and document these on video or in a photograph, but while those media might trigger a memory, they don’t capture the full sensory experience, the pit in the stomach, the welling up, the excitement. There’s part of me that wishes that I had captured last night’s game on video, but I know that it would end up in either a physical or virtual box, and that it wouldn’t have the power or impact that it continues to have on me today. Last night at a small baseball field in Dedham, Massachusetts I was taught the value of words and witnessed the emotional growth of my twelve year old son. Jax had been put in to pitch in the third inning. He has an arm, but struggles with control. Like his father, when he’s nervous or anxious, he speeds up in hopes that he can keep pace with the expectations that he’s placed on himself, speeding up then results in a loss of control, and through a combination of flexible little league strike zones (a father’s pride sneaks in), pressure and self doubt, seven runs are scored and the inning is called. He walks off defeated, I start to walk to him, to console him, to let him know that this is an incredibly painful, but powerful part of learning, but he’s not looking at me and quickly his teammates and his coaches gather round to offer encouragement, kindness and empathy. He acknowledges these things, but still avoids our gaze and stoically sits on the bench staring out at the field. After a couple minutes he takes off his glove and walks to Jessica and I, first there is the anger about the strike zone, an insistence that the fix was in before he took the mound. 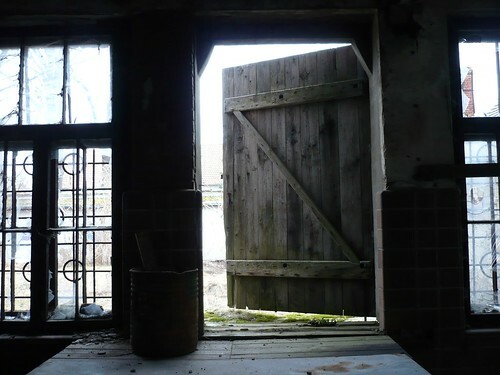 Quickly, however, the frustration and disappointment turn inward and the floodgates open. We tell him that we love him, we tell him that we know that this is hard, but that we are proud, and I am, not just fatherly pride, but proud that he stood on the mound while the wheels were coming off and that he kept pitching. He gathers his composure and sits back down on the bench. Moment’s later, he’s up. A year ago, he had a similar inning where 7 runs were let in and I spent the better part of an inning and a half walking and talking with him, wrestling with his frustration and anger. The rest of that game and the ride home were tough, but he lived to play another game. Today, fresh from the same sting, I have that same anxiety. I want him to put a ball in play, just to inch that self confidence up. One strike, two balls, two strikes, two balls. And whether or not its true, I feel that the coaches, his team mates and every parent whether for our team or the other is holding their breath in the hopes that he’ll find redemption at the plate. Sure enough, with the next pitch he lines a double through the short stop. A cathartic sigh. He’s stranded on second, but quickly runs out to play short. Over the next two innings, Jax fields five of the six outs, grabbing shallow infield pop flies, picking up tough grounders and preventing runners from making it to second and first. He is all business as his coaches and team mates congratulate him, there is still the sting of the third, but he lets out a small smile to Jess and I as he walks off the field at the end of each inning. The Dodgers lost it in the bottom of the sixth, final score 10-9, but the kids, coaches and parents couldn’t be happier. The coaches for the other team upon winning quickly calm their team down, and I’m grateful. At the post game huddle, the coach tells him how proud he is and hands Jackson the game ball. Earlier in the inning during his fielding fireworks I had heard a couple of his team mates remark that Jackson should get the game ball. I am proud of you Jackson, in so many ways. What class(es) should I take next? Which instructors am I likely to learn more from? Common questions that students face each semester. Every institution has formal and informal channels that get used, whether they are institution sanctioned academic advisors and student opinion surveys or back channel methods, like “underground” surveys, sites like ratemyprofessors and e-mail and casual conversation. These approaches, however, are either suspect in their depth and accuracy (ratemyprofessors.com, surveys) or costly to scale (academic advisors). Two recent mergers, Desire to Learn’s acquisition of Degree Compass and IAC’s (OK Cupid and Match.com) purchase of Tutor.com, bring interesting possibilities to this space, as the concept of adaptive learning is no longer strictly in the domain of content, but now extends to the instructor and course path that a learner takes as they pursue mastery. Degree Compass (modeled after Netflix and Pandora) takes your existing transcript information, along with historical data and the transcripts of hundreds of your peers and predicts how well you’ll do in a course. The developers claim that it is more than just a tool to aid grade inflation, as there are several data points that they use in their algorithm, and several recommendations made to the student, not just expected grade. D2L’s purchase will likely see the addition of this recommendation engine its your LMS. While fantastic at a large institution with substantial course offerings, I wonder how valuable this functionality is when the course offerings are smaller. As a student, I want not only the best statistics class that my institution offers, I want the best statistics class that caters to my strengths and weaknesses as a learner. With the rise of MOOCs, sites like Udemy and Skillshare and efforts of the Mozilla foundation to bring a unifying voice to micro-credentialing (badges), students have more learning opportunities, with different teachers, content and approaches, available to them than ever before. As demand grows for education that is designed for the individual learner, large institutions will have a tough time developing highly personalized content. To this end, I find the IAC and Tutor combination a little more intriguing. Fewer details exist on IAC’s plans for Tutor, but the New York Times suggests that IAC will be bringing their analytics expertise to Tutor, perhaps to aid in instructor selection (identify my ideal instructor match based on my learning profile), perhaps to give tutors/instructors better diagnostic tools (how should I approach teaching this student? ), perhaps even extending to a point of taking the learner profile and creating a personalized learning skill tree (What combination of experiences should I employ to allow me to reach a particular level of mastery or understanding?). Both platforms and their acquisition suggest that adaptable learning paths, and not just content, through deep data analysis will be an interesting space to watch as educational technology continues to evolve. A world where every student has access to not only high quality learning, as the big MOOC players promise, but personalized high quality learning. I was reading David Wiley’s post on the beta release of Degreed this morning, when I was inspired to create this post. Degreed is a new startup that promises to “jailbreak your degree” by allowing an individual to build a more comprehensive dashboard of their education, incorporating official academic transcripts, work experience, MOOCs, and more. There’s a tremendous amount happening in the space of profiles, personal dashboards and badges in education, and the screenshots looked cool, so I excitedly clicked over to check out the service. I was greeted with a big, Login with Facebook, and instead of clicking that big blue button, I opened another tab and started this post. Why? I distrust facebook. I use facebook, sparingly, but have felt that historically they’ve been playing a shell game with my privacy. You might say, “privacy’s dead” and I might agree with you. You might say, “I trust Facebook more than Google” and that’s fine too. I recognize that others distrust Google, Apple, Twitter, Insert Company Name Here. My issue with the Degreed beta isn’t that it has a Facebook login option, it’s that it’s the only option. There’s something funny about the idea that your degree is being liberated but you’re being locked into a single authentication method. Hopefully this will change, as I’m sure that the Degreed team is building something that I see as a great need: accounting, documenting and vouching for a lifetime of learning. I also understand from Wiley’s post that the likely reason for the facebook option is that part of the initial setup up of Degreed involves understanding a user’s education history, and that this is accomplished by scraping education data from facebook, but I would rather give you that information on my own. How do you feel about the Connect/Log In with facebook option? You know the old saying about your eyes being larger than your stomach? My thirst for new knowledge is larger than the capacity of my brain. 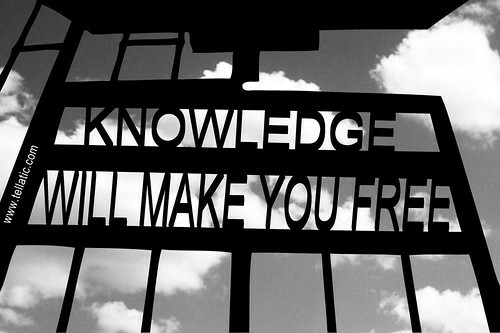 This has become apparent to me as I recently took stock of the MOOCs (Massive Open Online Courses) I’ve signed up for. I’m enrolled in 5 courses that are currently running, and a couple more that are supposed to start in the next few weeks, and those are just the courses that I’m taking through Coursera.org . When you add a course Udacity, the edtech startup MOOC that I’ve been guiltily ignoring, the two I just signed up for via Stanford’s venturelab and a course at edX, there’s no way that on top of the four seven week classes (2 at a time) that I’m taking this fall as part of my MBA curriculum that I’ll make it through all of them (or any). One could say, and I’d agree with them, that I’ve bit off more than I can chew, but when you’re in this free store of information, it’s hard to say no. Despite my addiction and the strong likelihood that I falter along the way, I’m trying to stay on top of my quizzes, my assignments, my peer grading and videos/readings. The time I’ve spent in these courses has been been both fascinating and frustrating. There are some truly adventurous and engaging faculty (Finance complete with Star Wars/Lord of the Rings references anyone?) looking to share their expertise and knowledge and a global population that is eager to learn, connect and collaborate. At the same time, as you try to manage a discussion board with thousands of participants, it’s easy to feel that you are just part of a herd being shepherded from course to course. All of the players in this space are students as well, learning as they go, and adjusting on the fly. As I try to deal with this overload over the coming months, I’ll capture MOOC moments to celebrate as well as challenges I encounter, and encourage you, dear reader, to weigh in with your own thoughts. One of the things that drives me crazy with Google Docs/Drive is when I convert an existing Word/Excel/Powerpoint file into Google Docs format. The converted doc gets placed in the top level (root) of my Google drive instead of in the folder that the original office doc is located. In a recent “duh” moment, I clicked on the folder Icon next to the file name. Clicking on the folder icon shows where the file is currently located, while clicking the big blue Organize allows you to quickly change where the file is stored! Just click on the folder you’d like to move it to and click the Apply changes button. Voila! Much of my course work has a team or group component. While it’s great to distribute the workload and have the opportunity to collaborate, coordinating schedules and getting everyone in the same room is often a challenge if not impossible. 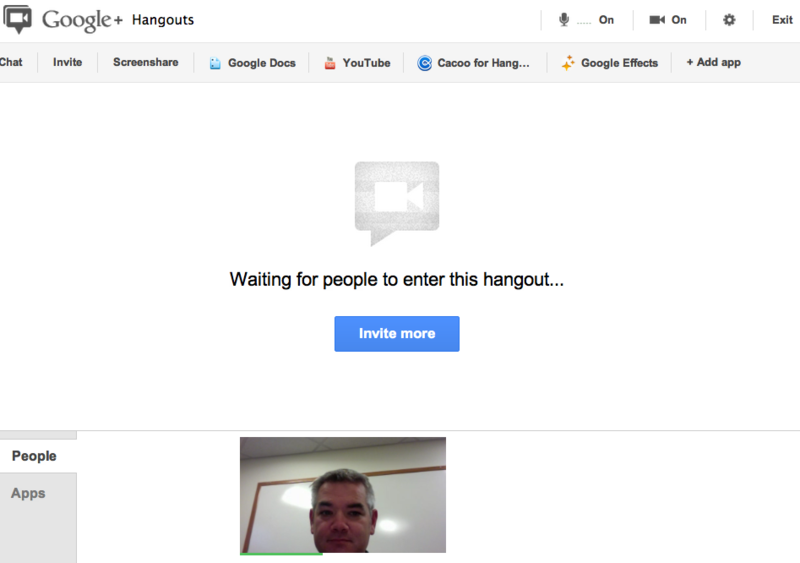 To address this problem, the teams that I’ve been working with have adopted Google Hangouts. In the class that I’m taking right now, we’ve had four projects due, and outside of class we’ve only met face to face once. Intrigued? Read on. Hangouts are a feature of Google’s social network Google+. Up to 10 people can simultaneously video/audio chat and collaborate over the internet with this powerful tool. Participants can join Hangouts from their laptop/desktop/smartphone or be dialed in if they are in an area without internet service. In order to use Hangouts, there are a couple technology pre-requisites. 1. You need a Google account. 2. If you’re using a desktop/laptop you’ll need to install the Google Voice and Video chat plugin . *optional* If you want to connect using your iOS or Android device, be sure to download the Google+ app. *optional* For each class, I create a Circle, an organizational tool in Google+. This semester I’m taking EPS7545, so I’ve created an EPS7545 circle that I’ve added my four team members to. This just makes my life easier when I’m setting up the Hangout. Now, assuming that you and your group members are all setup (meaning they have their Google+ accounts set up), it’s time to get to the good stuff, starting a Hangout! The first input box is where you enter the names/e-mail addresses of the people you want to hang out with. Hangouts will default to inviting everyone that we’ve placed in circles. For our cases, however, we’re looking to hang out with a specific group, so remove the “Your Circles” blue button in the invite box. 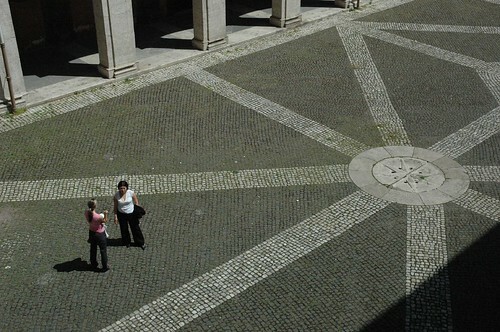 If you did the optional step and created a circle for your group, all you have to put in is the name of that circle, otherwise you can enter the e-mail addresses or circles of the people you want to invite (*note* they will need a plus account to join and will be prompted to create one if they don’t have one). To keep things simple, there’s not a real reason for us to name the Hangout or enable Hangouts On Air, so you can skip these steps. Finally click on the big blue Hang out button, you’re Hanging out! The People area – Along the bottom third of the Hangout screen you’ll see the video thumbnails of the people who have joined your Hangout and the Apps that are currrently enabled for the hangout. The Content area – In my screen shot, I’m the only person in the Hangout, otherwise you’d see whomever was talking in the content area, the app that was active or the screen that was being shared. The Upper menu – Above the main content area are a series of button that will allow you to text chat, invite more people (including dialing someone in over phone), share an application or your whole screen, bring up a google doc for everyone to edit, bring up a youtube video for everyone to watch or add one of the many Hangout apps that are available, such as a sticky note brainstorming wall, mind-mapping diagramming, etc. In your activity stream (just click the blue Join button). In your notifications (Red number in the upper right hand of Google Plus). By clicking on the Hangout button in the left hand nav (if you don’t see it, click on the More button). 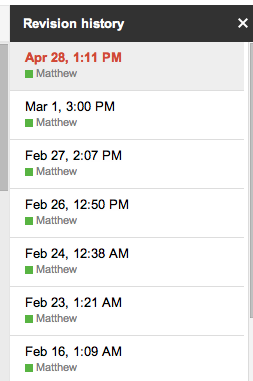 To configure how your notified of hangouts, visit Google’s help page on Hangout Notifications. That’s about it. If you get stuck, Google’s help for Hangouts is also fairly comprehensive. It may seem like several steps to get up and running, but it’s important to remember that once you’ve done the set up the first time you’re done, each subsequent time you’ll be up and collaborating in seconds. There are many alternatives to this. WebEx, Skype, etc, but the integration with Google docs and the price (free) make Hangouts a winner for me. What are you using to bring your team together? Let me know in the comments. While it may seem to many that Google Docs (Now a part of Google Drive) might be an obvious choice for group collaboration, I’m surprised by how many people I talk to that are not aware of how effective this cloud based app is, or have written it off as a cheap Microsoft Word imitation. I thought I’d just run through a couple of use cases of how I incorporate it into my daily workflow. Google Docs is not Microsoft Word – The faster you can come to accept this, the easier you’ll be able to realize its full potential. The Google Docs interface can be frustrating and confusing – There are definitely some UI changes that I would make to docs if I were king of Google, but I feel the same way about Word or when it comes down to it, any application. Changing habits takes time and a certain level of commitment – Like an exercise regimen, it’s easy to quickly adopt and abandon new tools and workflows (I recently told my partner that she should put “Look a Shiny Thing” on my tombstone). If you choose to adopt Docs, stick with it for awhile. You’ve got your browser open anyway, why open another application and slow down your machine? I’m not sure about you, but I’m constantly juggling resources on my machine, and having one less application open is always a plus. Combine this with the fact that my browser (Chrome) is always open, Docs is just a tab away! Did I click save before my computer crashed? No need to anymore! Docs is constantly saving automatically, so there’s no worry about losing work. In addition, Docs saves a history of previous versions as it goes. While I know that version history is available on platforms like Sharepoint, what I like about Docs is that it requires no effort from me as a user. This goes a little bit to my previous post around persistent file storage, but I feel that we’re evolving as a technology culture to the point that while we enjoy our machines, our personal content (our music, our pictures, our documents) and their constant availability to us is no longer a convenience, it’s an expectation. 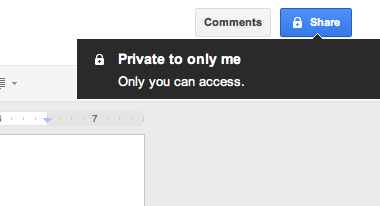 Anything that I put in my Google Drive is available to me no matter where I am. As long as I have a browser, I have access and can continue to work. I’ve even got my kids using Docs for their homework so there’s never an issue of lost homework (until there are virtual dogs to wreak havoc). Sharing is dead simple with Google Docs. In the upper right corner of any document you’re working on is a bright blue Share button. Click it, add the e-mail addresses of the people you’d like to collaborate with, specify what privelges you want to give them (Read Only, Read/Write, Ownership) and you’re set. Your collaborators will get an e-mail and a link that will take them right to the document. Not only can you share single documents you can share entire folders. While I’d argue that the reasons above are the most practical to adopt Google Docs, live collaboration was the feature that the geek in me was most excited about. What do I mean by live collaboration? The basic idea is that multiple people can work on the same Doc/Spreadsheet/Presentation at the same time and you can watch changes happen live. As everyone types, you’ll see a customized color cursor updating the document while they type. For group and remote team work this is a fantastic time saver. At work, my group has adopted docs as our default note taking application. When a meeting starts, someone creates and shares out a doc. As the meeting progresses, we are all adding to the shared document and time is saved when nobody has to merge or e-mail the doc after the fact. In addition to the collaborative editing, Docs also has embedded chat (just like Instant Messaging, but just with collaborators that are working on the doc with you) and commenting with e-mail notifications. While editing a Google Doc, just click on Insert>Image>Search, and get thousands of possibilities to enhance your document! Drive gives you at least 5GB of storage (more if your school or business has Google Apps), which is plenty of space for documents, but the best part is, your Google Docs/Spreadsheets/Presentations don’t count against that quota! 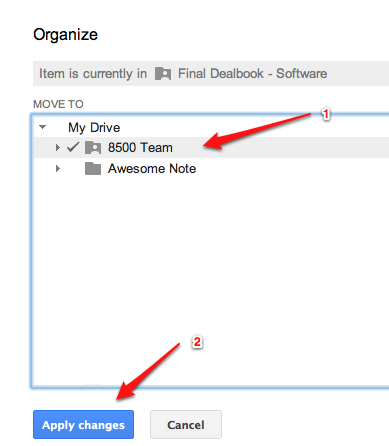 If you have existing documents/files that are in formats other you can store them in your Google Drive. Which leads to the last reason…. This one’s kind of a gimme, given that Google is a search company (or advertising company 🙂 ). Keyword search is capable across all documents (both google docs and most other document formats, including .doc, .docx, .xlsx, .pptx, and .pdf). 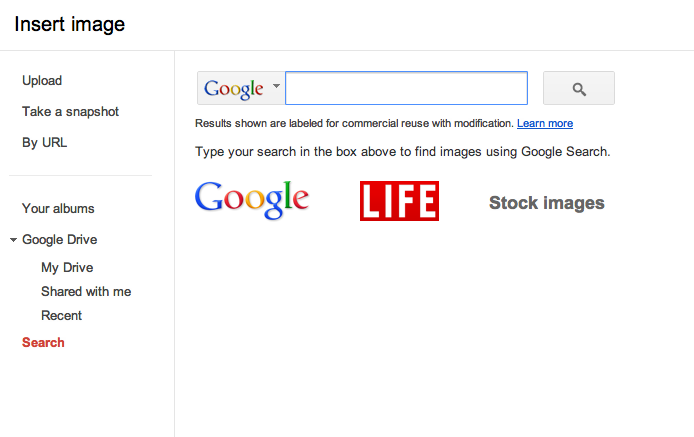 While I haven’t tried it, word is it’s keyword search works for images too! I’m a big fan of Google Docs/Drive as you can probably tell, but there are several competitors out there, including Microsoft’s Sky Drive that offer similar capabilities. What are you using for cloud document storage and work? Leave a comment.